It’s this sense of daring that makes Haslam one of the most exciting designers working today. And even though he’s 73 years old, he isn’t slowing down. Quite the opposite. In 2012 he opened his first Canadian office, in Toronto (helmed by his long-time creative director, Colette van den Thillart), and has recently launched his own line of exuberantly patterned wall coverings, the Random Harvest Collection (think plush velvet printed in a wildly colourful, pebble motif). That, in addition to dancing with Paris Hilton, writing for T, the New York Times style magazine, and putting out music videos to promote his debut album, Midnight Matinee, which will be released in July (Rupert Everett, Bryan Ferry and a host of others make guest appearances). In many ways, Haslam was reared to be glitzy. He has no formal training in design. “There were no art schools in those days,” he explains. “Partly because the Second World War made people think we would all have to live on gruel and old curtains.” But his life has been a master class in the finer points of luxury – an education that started early. That longing for fantasy is still palpable (as well as his love of AstroTurf – he just bought some for his current apartment). But he doesn’t have a specific signature look. Instead, he’s notable for layering seemingly disparate things – oversized baroque wall details with Picasso paintings and shimmering silk upholstery, say – but making it look entirely effortless and as though the room had been that way forever. Befriending notables appears to have been Haslam’s earliest career aspiration. Long before garnering attention for his gilt-edged rooms, he was famous simply for his social life: his friendship with Swinging London photographer David Bailey helped inspire Antonioni’s film Blow-Up; after moving to New York in 1962, a floor-bouncing party he threw for the Rolling Stones was immortalized in a Tom Wolfe essay, The Girl of the Year; and Andy Warhol credited Haslam in his book Popism with helping the artist get established in Manhattan’s high society. Haslam’s own rooms, in contrast, often have a distinctly maximalist feel. “More is more,” he says. “But the more has to be put in with a certain style.” He had the opportunity to hone his aesthetic under the tutelage of some of the best. In his 20s, he worked in the art department of American Vogue for famed editors Jessica Daves (“a dumpy, dour old lady who was really only interested in making people look old”) and then Diana Vreeland (“she discovered this wonderful thing called youth”). But Haslam didn’t really have the chance to put his own stamp on design until the 1970s. A long-term relationship with a Rockefeller scion, Jimmy Davison, had brought him out to Arizona in the mid-1960s. The two were living in a ranch house (which Haslam decorated with washed-out white walls, blue ceilings and Navaho rugs) and raising Arabian horses. But when the affair ended, Haslam moved back to London. Haslam was in his 30s, broke and didn’t know what to do with himself. But he had always enjoyed designing his own spaces. And he had, after all, spent his life absorbing art, culture and design from the very people who set the trends. Those taste-makers, in turn, started giving him work. 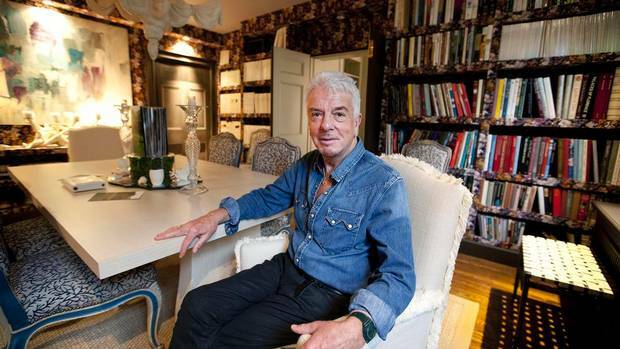 He did rooms for Camilla Parker Bowles’s brother David Shand and writer Robert Elegant. And eventually the commissions got bigger – as did the notoriety. Spreads in Vogue and World of Interiors. Projects for Charles Saatchi and Bryan Ferry. Part of his success, and ability to work with highly demanding people, must be attributed to his relaxed nature. “I always grab the moment,” he says. “My old friend, Lady Diana Cooper, used to say, ‘Take the dare, say yes, you can always leave, you can always stop it.’ ” It’s something that is reflected in his work – despite their over-the-top detailing, his spaces always have a sense of comfort. This entry was posted in Design Spy and tagged Cecil Beaton, Colette van den Thillart, Decor, Design, Diana Vreeland, Eton College, Interior Design, Mick Jagger, Nicky Haslam, Rod Stewart by mmhague. Bookmark the permalink.